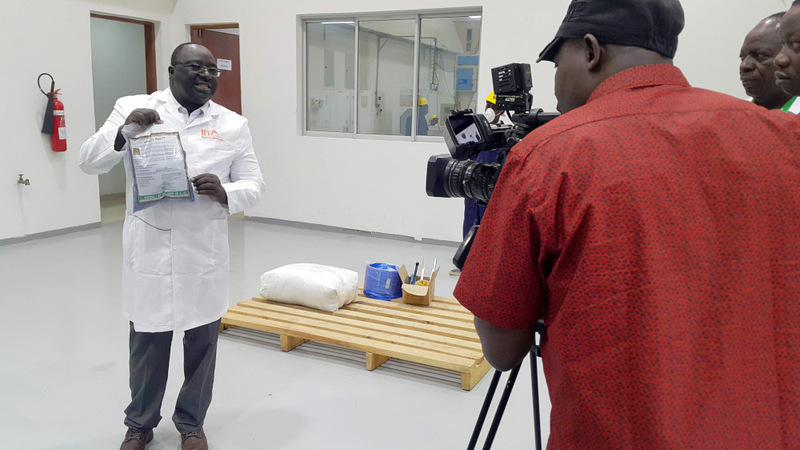 Flying high: Lawrence Kaptoge, engineer and Aflasafe manufacturing specialist, holds aloft a perfect package of Aflasafe KE01 for visitors from Kenya’s Presidential Strategic Communications Unit. Eng Kaptoge manages the first Aflasafe factory in Nigeria, and has been instrumental in developing and supporting the Kenya factory. Aflasafe commercialisation in Kenya is unique in that our primary manufacturing and distribution partner – the Kenya Agricultural and Livestock Research Organisation (KALRO) – comes from the public sector. Due to this special relationship, and for many other reasons, we particularly cherish our bond with the government of Kenya. Due to a history of outbreaks (see a recent example), aflatoxin is recognised as an important public-health threat, so the government keen to act, and its deep and wide reach ideal for getting the Aflasafe message and product out there. We therefore take much delight when Aflasafe KE01 gets a spot of the national government limelight, giving us an opportunity to reach millions. On one such recent occasion, we hosted the Presidential Strategic Communications Unit of Kenya on a visit to the Aflasafe KE01 factory at Katumani on 27th September 2018. Their mission: to highlight key stepping stones for the government in achieving its Big Four Agenda, a top-priority fourfold drive to achieve greater economic prosperity and stability. Its four pillars are universal health coverage, manufacturing, affordable housing, and, probably most important of all, food security and nutrition. In backing Aflasafe, the government recognises that food safety is an essential aspect of food security: food that harms you cannot help keep you healthy and nourished. By keeping poisonous aflatoxin out of food, Aflasafe can help us all to live longer and more productive lives, and opens up more lucrative markets for farmers and national exports. 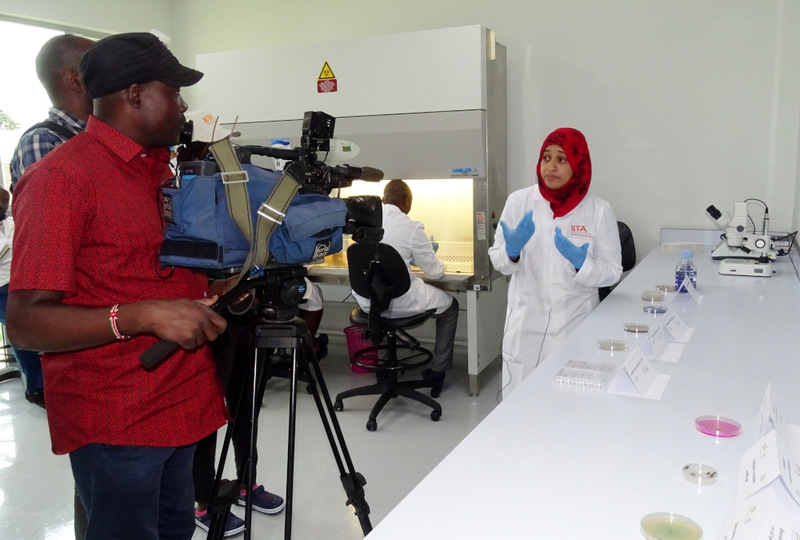 Visitors from the Presidential Strategic Communications Unit film lab technician Asha Bakari explaining the steps in the Aflasafe KE01 production process. The visitors were impressed by the facilities and the production process at the factory, which is currently jointly run by KALRO and IITA. The Presidential team has since produced a video on food security using content captured during their visit, as well as material from other flagship products around the country. This will be aired on local media stations across Kenya in the near future –and we can’t wait to see Aflasafe KE01 as a small-screen star! No-one can go it alone, however, and ATTC and KALRO are working together to implement a dual approach harnessing the strengths of both the public and private sectors. We are actively seeking, negotiating with, and mobilising additional distribution partners with on-the-ground expertise to supply Aflasafe to farmers countrywide as rapidly, efficiently and effectively as possible. We anticipate having new partners selling Aflasafe, in addition to KALRO outlets. Same powerful product, same packaging… different sizes! 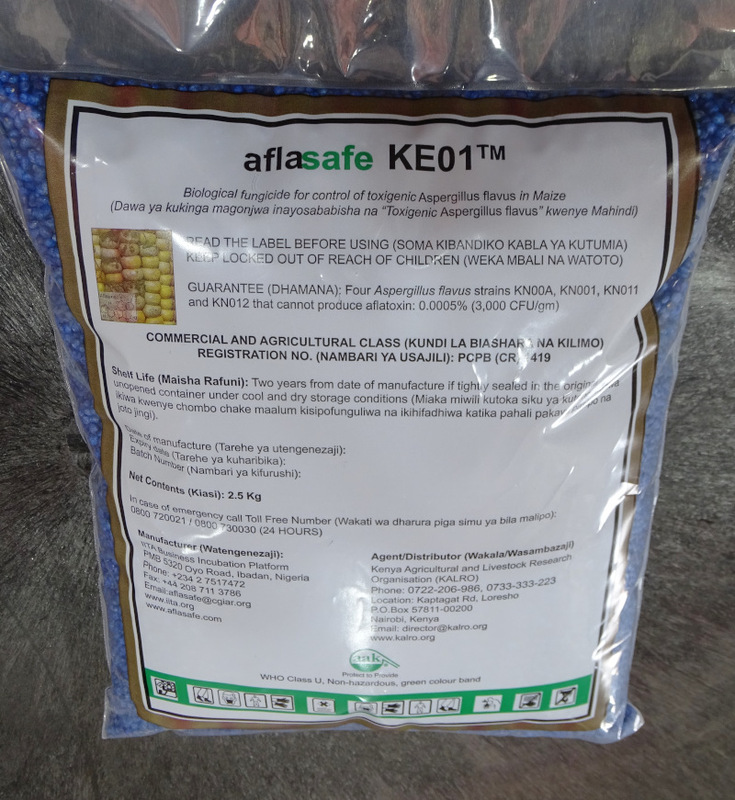 Adapting to the Kenyan market means selling Aflasafe KE01 in quantities farmers and dealers are used to working with. ATTC has a tailor-made commercialisation strategy for each country, created and fine-tuned with partners on the ground to reflect local agriculture, industry and markets. Each Aflasafe product is also unique to each country or agricultural region, made with naturally-occurring local good-guy fungi that crowd out the aflatoxin makers. And in addition to all this customisation, sustainable commercialisation means fitting in and adapting in all kinds of other ways too. The currently registered pack sizes for Aflasafe KE01 are a standard 2.5 and 5 kilos. However, this isn’t quite right for Kenya, where land and farms and therefore agricultural products – are thought of in terms of acreage. Agro-inputs come in sizes that are suitable for a quarter, half, or one acre of land, with the actual quantity of the product depending on the area it can cover. For one acre, 4 kilos of Aflasafe are needed, which means that the 2.5- and 5-kilo pack sizes are confusing to, and inappropriate for, the Kenyan market. 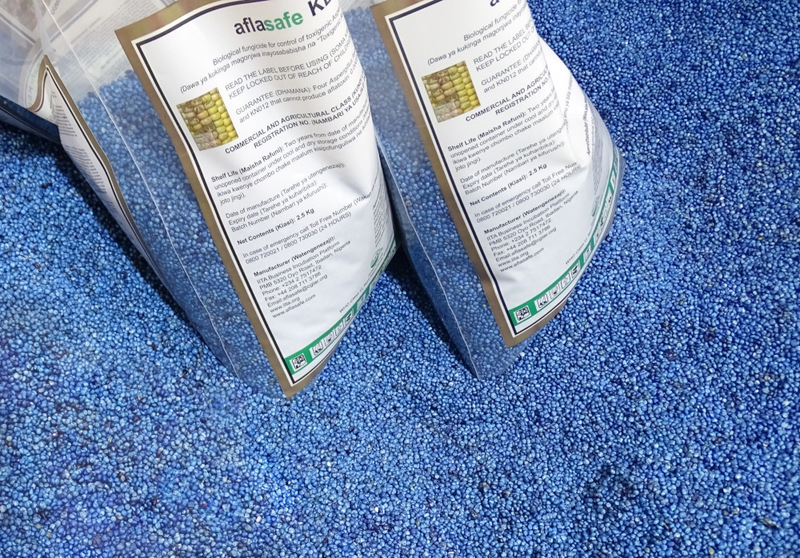 Another thing that won’t change about Aflasafe KE01 is its striking blue colour: our friendly aflatoxin-busting fungi travel to the field in a combined taxi and picnic basket in the form of sorghum grains that act as both carrier and food. We dye these blue to distinguish from ordinary sorghum for eating. Realising this, and also spotting a need for larger packs, the Aflasafe team applied and had approval successfully granted for additional pack sizes of 2 kg (half an acre), 4 kg (one acre), 10 kg, and 20 kg. This small but powerful change will make the product much more intuitive for both smallholder and large-scale farmers in Kenya, as well as agro-dealers, better meeting their needs. With in-country Aflasafe KE01 production well underway, on top of making a tip-top product it is also essential for the factory to fulfil all related norms and regulatory requirements. In light of this, ATTC recently supported the factory’s application for membership of the Agrochemical Association of Kenya (AAK) – part of the statutory compliance requirements for Aflasafe manufacture. Following mandatory circulation among AAK members for general approval, membership was granted in September 2018. Adapting our commercialisation strategy, building partnerships, and responding to feedback is an ongoing process. We are confident that Aflasafe KE01 and Kenya is a match made in heaven – and a marriage that will only get stronger as the years go by.